Join us for a performance of this classic opera! Generously discounted tickets available through March 16. Preceded by dinner at Sakura. Verdi’s sinister t ragedy. This time-honored tale of seduction and bitter revenge is boldly imagined in this new production. The disfigured jester Rigoletto must do everything in his power to protect his innocent daughter from the lecherous Duke of Mantua before she falls into his clutches. 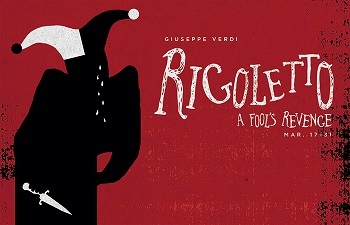 Brimming with rich melodies and featuring the famous aria “La donna è mobile,” Rigoletto tragically unfurls as it races toward its devastating conclusion. Call the Minnesota Opera ticket office at 612-333-6669 by March 16 and mention the Yale-Harvard event. The office is open Mon-Fri 10AM-5PM. RSVP for the dinner by March 27 via email to james_p_richardson@msn.com. Include the attendee's names.